Wayne Rooney should be available for inclusion in Roy Hodgson's England squad despite a fresh injury worry. 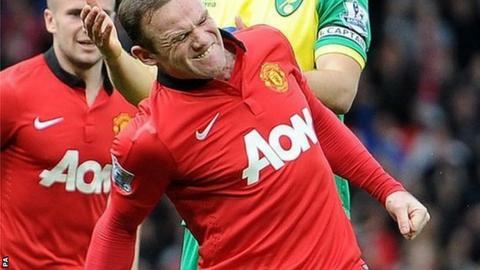 However, the BBC understands Rooney will miss the Old Trafford clash with the Premier League strugglers. The setback comes just 10 days before Hodgson names his squad for the 2014 World Cup finals in Brazil. According to Giggs, Rooney has also been ill.
"A few of the lads have had a bug," said the Welshman. "Wayne Rooney has, Anders Lindegaard has. Wayne has a tight groin, too. Together with the bug, it means his immune system is down so we have to watch that. "Wayne being Wayne, he wants to play and wants to be involved. We will monitor it over the next 24 hours." As he prepares for his second game in charge following the sacking of David Moyes, player-boss Giggs hinted that Robin van Persie could feature this weekend. The Dutch striker has been out with a knee injury since scoring a match-winning hat-trick in United's victory over Olympiakos on 19 March. "Robin has been back training and looks good," said Giggs. "I'm just trying to keep myself fit and try to win every game. I might not get into the team!" Giggs also addressed continued managerial speculation around United. He has been tipped to become the full-time successor to Moyes by some of his team-mates, but it is thought United want a more experienced man. Talks have already taken place with Netherlands coach Louis van Gaal, who remains the leading candidate. "Nothing has changed," said Giggs. "We will chat when the season is over. The main concentration I have is on the Sunderland game and then after that the remaining two games. "I have a lot to think about and whether to continue playing, but my concentration is just on now. "We will see what happens at the end of the season."